Artist Mary Jo Mann was looking around her neighborhood in Southeast Portland for inspiration during the spring and summer of 2016. She’d walk up and down alleyways in Ladd’s Addition and ride her bike along the Springwater Corridor toward Sellwood. She began to notice weeds growing out of cracks in the sidewalk and the crevices of buildings – places where ornamental garden species were unlikely to survive. “It was interesting because some of these weeds, they didn’t need a lot. They managed to find their way in very difficult kinds of places and do OK,” she said. She realized that despite their categorical ostracism, these weeds were dazzling in their own manner. 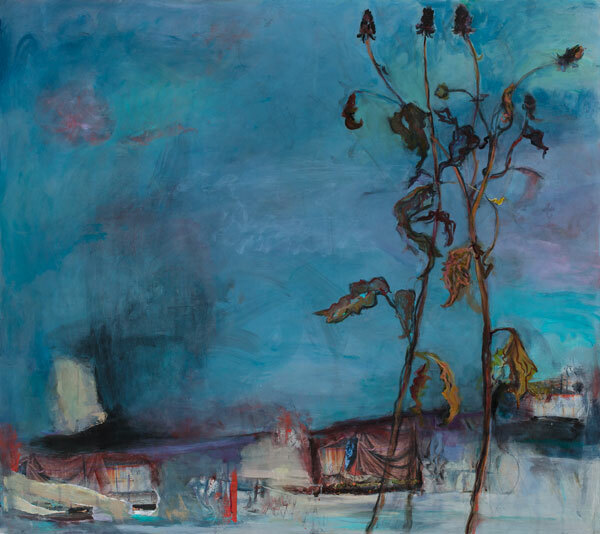 Mary Jo Mann’s latest collection, “Un-Becoming,” explores the connection between different societal outcasts, weeds and people experiencing homelessness, finding beauty in their shared survival. She began to collect specimens, clipping the weeds, and sometimes pulling them out by their roots, to take back to her home studio so she could paint their likenesses with ink and fluid acrylic. As she sought out these little garden invaders for inspiration, she also happened through homeless encampments and passed by people sleeping in doorways and under overpasses. While Mann earned a bachelor’s degree in fine arts from Seattle University, she spent her career working as a software developer at Standard Insurance in the heart of downtown Portland. She was accustomed to seeing people who lived on the city’s streets as she went to and from work on a daily basis. She noticed, however, that the homeless population seemed to “mushroom” over the past five to six years, she said. Now retired, she is focusing on developing her artistic abilities but has also tried to understand issues around homelessness. She volunteered her services at p:ear, a drop-in center and art studio for homeless youths, and has donated some of her paintings to Central City Concern’s Healing Through Art Collection. It’s a collection of nearly 100 original pieces of fine art from Pacific Northwest artists that decorate the nonprofit’s housing and homeless service facilities across the metro area. In October, Mann’s “Un-Becoming” will be showcased at Gallery 114 in the Pearl District. The gallery is a cooperative owned and operated by 11 artists who take turns exhibiting. Mann has invited Horatio Law, a professional artist and Pacific Northwest College of Art faculty member, to exhibit alongside her. Law specializes in public art pieces and using unconventional materials to create his often large-scale, three-dimensional works. “Burnt Offerings” features a grid of 25 faces of Syrian refugee children, taken from photographs Law found on the internet. A lightly charred origami butterfly accompanies each child. Horatio Law’s “Burnt Offerings” display features the photographs of Syrian refugee children, along with their photos folded into lightly burned origami butterflies. The idea came to Law, in part, from an artist residency in Sisters near the foothills of the Cascade Mountains. The surrounding forest had been ravaged by wildfire several years earlier and was in recovery. “It was an inspiration to see the force of nature and also how living organisms endured this fire, and they sprung back, and all things recover after the fire,” he said. The project is also personal. Both of Law’s parents were Chinese refugees who fled the Japanese during World War II, landing in Hong Kong, where Law was born. He remembers his parents talking about the hardships of fleeing, of being in an occupation and of trying to escape. 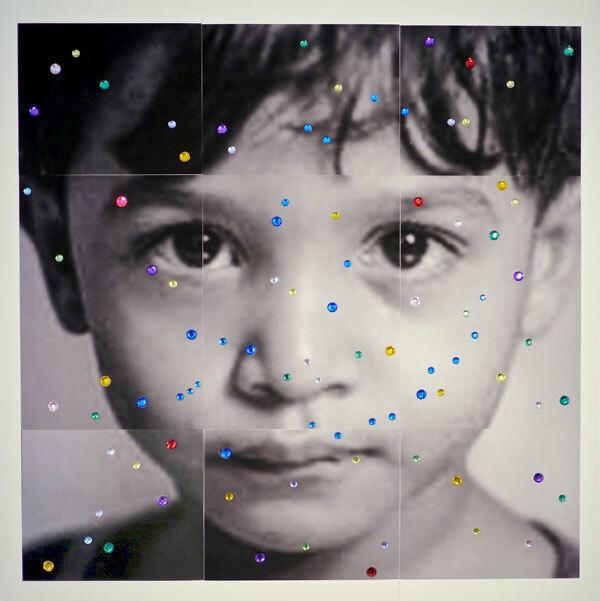 Law balances the tragedy he’s displayed with “Stargazers.” This, too, features photographs of Syrian children, but this time he has overlaid their faces with constellations, such as Pleiades and Orion, drawn with plastic gemstones. He imagines that as the children are fleeing with their families in the night, traveling over desert and over sea, they have hopes and aspirations about the new place they will call home. When they look up, they see the constellations twinkling in the sky. Horatio Law’s “Stargazer” collection features the faces of Syrian refugee children overlaid with gemstones in the shapes of constellations. He imagines the children look to the sky as they flee at night over land and sea, full of hope and expectations. Director’s Desk: Persist. Unite. Fight for social justice.